I should really like this leather headboard, but something is off about it. It's so droopy and poorly wrapped. The whole things just seems sloppy. It is a common occurrence for a friend of mine to move into an apartment with an unattractive kitchen/bathroom/etc. They ask me how they can spice things up, and I throw a bunch of suggestions at them: paint/collage/drape/vinyl/etc. More often than not, they end up learning to live with the eyesore because they are not ready to put in the work/money to try and solve the problem. Well, who ever asks me next is in luck, because I am going to suggest washi (after reading about it on Design Sponge) . It seems like a much more user friendly alternative to vinyl, and a much easier solution than painting. I am not sure if it ends up being cheap or pricey. I guess it depends on the project. I painted this wall in my dining room the old fashioned way, but I suppose I could have achieved a similar effect from using this tape. Speaking of my dining room, I should really write a post about how to paint stripes on a wall. All in good time. When did Anthropologie.com become such a great source for interesting furniture? There are so many unexpected and outlandish pieces. Can you believe that this is a chain store with a branch in your local mall? But the strangest thing of all is this massive (overpriced) LARPing tent, that is moments from being swept out to sea. I started watching this completely hilarious show called Miss Fisher's Murder Mysteries. It is about a Sherlock Holmes-type flapper who solves crimes in Melbourne, Australia. The series opens on a man dying in a gorgeous old bathroom. I just love a good washstand sink. I have had my eye on this Restoration Hardware model for ages, but its a bazillion dollars (on sale for $1395), and only comes in chrome or nickle (and everyone knows I live for brass). I suppose the style isn't for everyone. I love all the exposed under bits, but there is no room for storage, and minimal counter space. In reality, maybe it's more of a guest bathroom sink. Minimalism: WHERE IS THE STUFF?! okay, just breath.... get yourself under control. I swear, here and now, that I will not post pictures like this, and make it seem like this is attainable by humans (Hillary is still allowed to). Everyone has stuff, and making that stuff look good is, in my opinion, what it's all about. Hahaha more like House of Amazing Bathroom. Can I get a "What What"?! Why yes, Kevin Spacey, I do want to get in that tub. One could only call the storage options 'ample'. So let's just face facts. 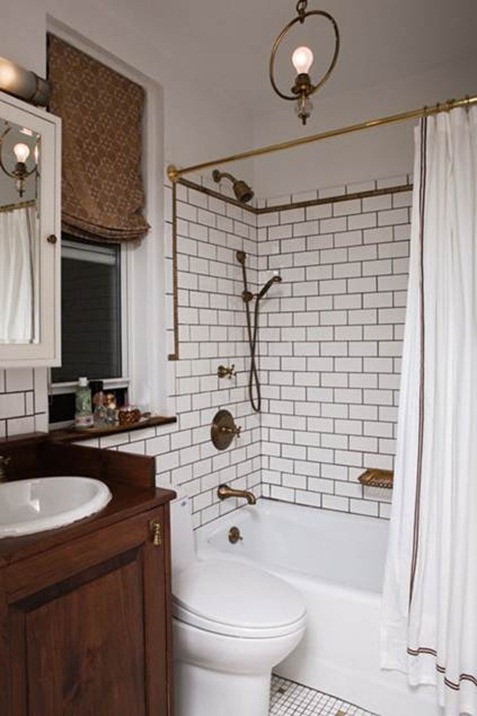 This is a great bathroom (if you aren't a shower person).